*This post updates the Aug. 6, 2015 piece, State Constitutions: The Next Frontier in Voting Rights Protection. On the 50th anniversary of the Voting Rights Act, in August 2015, I wrote that "A renewed, independent focus on state constitutions and their explicit grant of the right to vote would restore the importance of the most foundational right in our democracy." In the Trump era -- with false claims of widespread voter fraud and likely calls for new restrictive voting rules -- that reliance on robust state constitutional protection is more vital than ever. Reformers who care about protecting the right to vote face an uphill battle in the current political environment. The Trump White House, the Republican-led Congress, and even many conservative-controlled state legislatures are unlikely to enact meaningful voting rights reform in the near future. The Supreme Court, especially with a new conservative justice, is unlikely to alter its crabbed interpretation of U.S. constitutional protection of the right to vote. State courts are therefore even more important in vindicating the most fundamental right in our democracy by checking partisan abuses and attempts at entrenchment. They must recognize the robust right to vote that all state constitutions confer and construe them as providing stronger protection than the Constitution. In a new Issue Brief, which stems from two recent scholarly articles on the subject, I argue that, particularly given recent Supreme Court rulings and the now-reduced force of the Voting Rights Act, the answer of how best to protect the right to vote lies with state constitutions and state courts. Unlike the U.S. Constitution, which merely implies the right to vote, virtually all state constitutions explicitly enumerate this right. We simply need state judges who are willing to construe broadly and independently these state constitutional grants of the right to vote. Part of the difficulty in finding a solution to our voting rights conundrum is that the U.S. Constitution does not provide an explicit individual right to vote. This might seem surprising given that voting is one of our most cherished rights. But the U.S. Constitution confers only “negative” rights, or prohibitions on governmental action. As a result, federal jurisprudence on the constitutional right to vote has been narrow, pigeon-holed under the Equal Protection Clause of the Fourteenth Amendment. The Supreme Court’s test for the right to vote allows states to impose burdens so long as they are not “severe,” and it fails to require states to justify their electoral laws with any specificity. This gives room to partisan legislatures to enact election rules that curtail voting opportunities. State constitutions, however, explicitly grant the right to vote, saying that citizens “shall be entitled to vote” or are “qualified electors.” These provisions go substantively further than the U.S. Constitution because they specifically confer voting rights. Yet many state courts have construed these state constitutional provisions on the right to vote to be in “lockstep” with federal jurisprudence. When state courts lockstep, they follow the U.S. Supreme Court’s lead in construing the scope of these individual rights, and in essence analyze the analogous rights in the state constitution as conferring the same level of protection as their federal counterparts. For instance, in 2014 the Wisconsin Supreme Court upheld its voter ID law largely by pointing to the U.S. Supreme Court’s 2008 decision refusing to invalidate Indiana’s voter ID requirement, even though the Wisconsin plaintiffs brought suit under the Wisconsin Constitution, not the Equal Protection Clause. This lockstepping approach is problematic when federal constitutional protection is narrow and insufficient, as is the case with voting rights. A lockstepping analysis for the right to vote has an inherent dissonance, as state courts are lockstepping a specific and explicit state voter qualification provision with narrower federal court interpretation of the implied right to vote within the general language of the federal Equal Protection Clause. The result is often a derogation of citizens’ state constitutional right to vote. Yet some state courts, such as the Arkansas Supreme Court last year in its voter ID decision, properly recognize that their constitutions go further than the U.S. Constitution in conferring voting rights. These courts have noted that state constitutions include significant authority to protect individual voting rights and correctly refuse to follow the more limited federal jurisprudence. This analysis gives full force to the broader, explicit protection of voting rights contained within state constitutions. It is also consistent with the U.S. Constitution, which points to state authority for voter qualifications. Under an approach that gives independent force to the state constitution’s broad conferral of the right to vote, the state should have the burden of showing why the law is a permissible exercise of its legislative authority. To do so, the legislature must present specific findings on how the law in question does not infringe the state constitution’s explicit provision of voting rights to its citizens. This flips the normal burden in constitutional voting-rights litigation. Federal courts in recent years have contracted the scope of the right to vote under the Equal Protection Clause. A renewed, independent focus on state constitutions and their explicit grant of the right to vote would restore the importance of the most foundational right in our democracy. 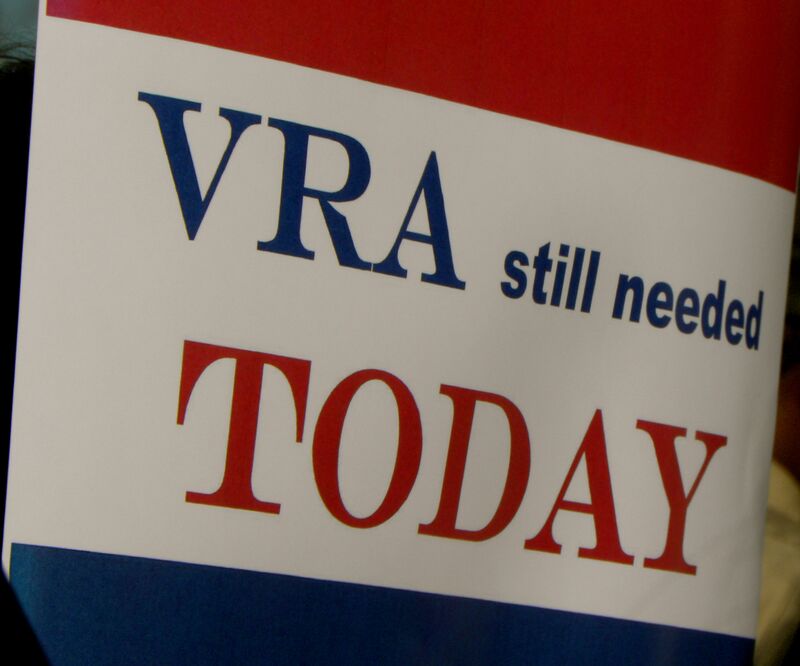 It would pay homage to the lofty goals of the Voting Rights Act. And it would ensure that, fifty years from now, we can look back and say that we are even closer to protecting the individual right to vote as robustly as possible. The 2016 election results show that this analysis is now more important than ever. One way to check lawmakers' attempts to entrench themselves in power by passing restrictive voting rules -- such as stringent voter ID requirements or strict proof of citizenship requirements -- is to advocate for state courts to serve as a bulwark by properly analyzing their robust conferral of the right to vote within their state constitutions.